"I had heard of your reputation for surgical expertise." Thank you for the wonderful medical attention. I had heard of your reputation for surgical expertise. However, it is quite another matter when medical services needed are for oneself. You have been thorough, meticulous and kind, all of which has been greatly appreciated. "Dr. Kirschenbaum was the right choice"
I knew Dr. Kirschenbaum was the right choice to be my surgeon; I’m thrilled that he chose to fix my shoulder at University SurgiCenter. Thank you for giving me my life back! Your bedside manner actually made this very serious surgery "fun". I am forever grateful. "You came highly recommended to me." I wanted to take the time to personally thank you for making my wrist surgery a very pleasant experience. I am overly impressed and very happy that I chose you for my Doctor. You came highly recommended to me. "It takes a great surgeon to work miracles." 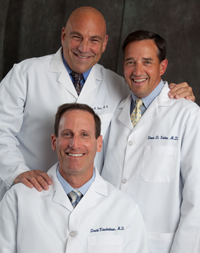 "Dr. Reich is a topnotch doctor."